Whizz the ice, rum, lime juice, sugar and chopped peach in a blender until slushy. 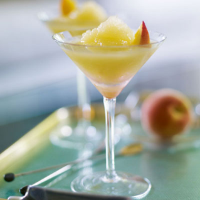 Pour into a chilled martini glass and garnish with the peach slice. You can cheat by using tinned peaches, or substitute Funkin White Peach Bellini Cocktail Mixer for the fresh peach and sugar.